To maintain the ecological integrity of the globally significant Kudat-Banggi Priority Conservation Area and to ensure that the rich marine resources are used in a sustainable manner – which is achievable through collaborative management among local and foreign, traditional and commercial fishers, and direct and indirect resource users who depend upon the continuous existence of these resources for survival. The journey to gazette this important marine area began more than ten years ago for the State Government of Sabah through its lead agency, Sabah Parks. However, this is drawing near to completion in 2015. TMP is situated in the Coral Triangle which is a 6 million-km2 marine area that directly sustains and protects more than 120 million people in coastal communities across Indonesia, Malaysia, the Philippines, Papua New Guinea, the Solomon Islands, and Timor-Leste. 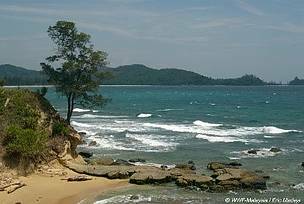 In 2003, the Tun Mustapha Park was proposed by the State Government of Sabah shortly after it was recognized as a globally significant priority marine conservation area. In August 2014, Sabah Minister of Tourism, Culture and Environment signed the Letter of Intent to gazette the Park, and the intention was published in the Sabah Government Gazette on the 28th August 2014. 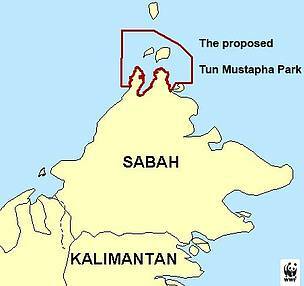 The process is now underway to ensure that Tun Mustapha Park is gazetted by mid-2015 and that these marine resources are sustained in perpetuity. Once gazetted, Tun Mustapha Park will be evidence of Malaysia’s commitment to the Coral Triangle Initiative and will contribute towards meeting the Aichi Biodiversity Target of least 10% marine areas protected and managed. 2010 – Sabah Parks and Sabah Biodiversity Centre shared intention to gazette TMP by 2015 at the Convention on Biological Diversity and the tenth meeting of the Conference of the Parties (COP10). 2011 - TMP Interim Steering Committee established with 6 Working Groups. The Interim Steering Committee will provide oversight to 6 working groups towards establishing a draft integrated management plan for the proposed Tun Mustapha Park that is managed through a collaborative management approach. The gazettement creates a legal platform for a concerted and collaborative effort to sustain and improve livelihoods, conserve biodiversity, manage resource use and extraction via a multiple-use park approach and will be a model for managing future marine protected areas in Malaysia.